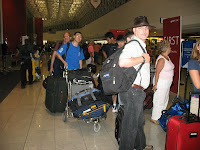 Paul Stanley, Senior Coach, called to let us know that the Physics Team arrived safely in Dubai a few hours ago. The time difference between Dubai and the US East Coast is 8 hours. So, in Dubai, it's a little after 9:00PM on Wednesday, July 11. Clearly the most important information from the group is that the weather is VERY hot and Sweaty with the temperature around 106. To cool off, the group took a Boat Ride on The Creek and then visited an air-conditioned Museum. They are now looking forward to having dinner and going to sleep. Tomorrow's plans are to go to the Beach, have a nice lunch and visit the American University of Sharjah in Dubai.